As the last of winter disappears and the weather starts getting warmer, I start itching to plant flowers. Most years we don’t see any snow after March, but a couple years ago we got a little in April. This winter did not bring much snow, so I’m even more ready to start planting. The kids enjoy helping me pick out flowers and planting them, although I suspect their favorite part is digging in the dirt for worms. 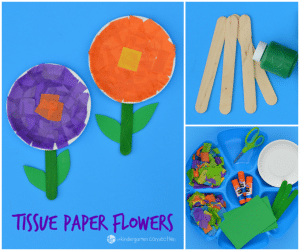 To hold us over until we can get our hands in the dirt, we made this super fun and colorful flower craft! We love to use paper plates and tissue paper for our crafts. In fact, we just used paper plates a few weeks ago for our rain cloud craft. They come in a large package, are inexpensive, and versatile, making them great to keep around for when we are feeling crafty! We did a tissue paper sensory bin a few months ago, and when the kids had their fill with it, I bagged up the pieces of tissue paper and saved them for craft projects like this. If you don’t have a bag of cut up tissue paper laying around, either prep it beforehand or have the kids cut/tear it as part of the project. Tearing up paper can be a really great fine motor exercise, so I would choose to have them tear it had I not had the squares already. You could still have them tear them up though – whichever you choose! 1. 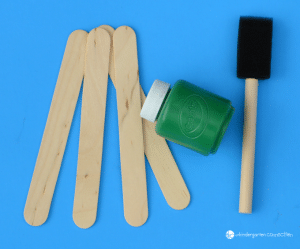 Paint the craft sticks green for the flower stem. 2. Cut or tear the tissue paper into smaller pieces. 3. Glue the tissue paper onto a paper plate. 4. 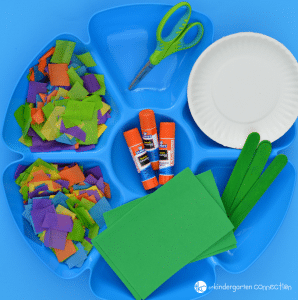 Cut green leaves from foam sheets or green paper and glue to the craft sticks. Ta-Da! You have a beautiful spring flower! 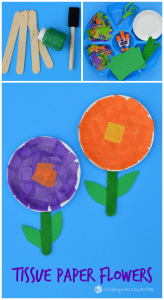 Use this flower craft to discuss the basic parts of the flower: stem, leaves, and petals. 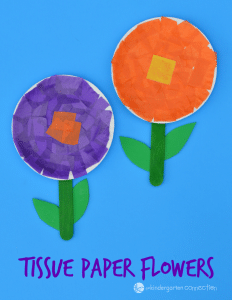 Use the tissue paper to discuss the delicate nature of the petals on a flower. Tissue paper can tear easily just as flower petals can become damaged if handled improperly. Looking for more spring themed crafts and learning ideas? Have a blast with our spring flowers play dough kit, have fun with tons of pond life activities for kids, or, if you are stuck inside on a rainy day, grab our spring coloring pages! Kim is a medical social worker turned stay at home mom to three.She enjoys sharing simple crafts and activities, parenting and homemaking tips, and a lot of holiday and seasonal fun at The Resourceful Mama. Kim is a medical social worker turned stay at home mom to three. She enjoys sharing simple crafts and activities, parenting and homemaking tips, and a lot of holiday and seasonal fun at The Resourceful Mama. Thank you so much for your amazing posts each week! I look forward to planning more now, because I know I will be able to get a few new ideas each week. Thank you for your kindness, expertise, and generosity. Thank you for your kind words! We are so happy to do what we love and create resources for teachers. Have a wonderful week!